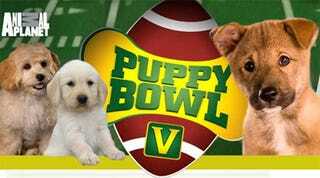 I know what Animal Planet's Puppy Bowl is: a stereotypical statement about how women hate football and love puppies. The thing is, some of us do dislike football and love puppies, myself included. If you aren't familiar with the Puppy Bowl, it's sort of like the Shiba Inu Puppy Cam on steroids (and about five years old). Animal Planet producers get a bunch of shelter puppies, stick them in a mock football field and tape them running around while an actual sports announcer provides commentary. It's also about the only original programming that any network bothers to run against the Superbowl. (I would show you clips of this year's matchup but — I swear to God — they embargoed them harder than Obama's Inauguration day speech, so I would recommend watching some of last year's show.) Below, an introduction to this year's competitors. Madeline the "Regal Beagle," who reportedly loves chasing squirrels. Eli the Australian Shepherd, who prefers Vegemite with his bones. "Mistress of Mutt Mayhem" Elvira, an Australian Catahoula mix, who "howls at the moon." "Big" Mac, who "tackles with the force of a Mack Truck." "Our Lady Linebacker" Bella, who we are reliably informed "owns 30 rhinestone collars." Oh, and while the puppies are on a break after the first half, those kitten lovers get their own all-new kitty half-time show complete with cat toys and wacka-wacka music — if your head hasn't already exploded from the puppy cuteness and Pepper the Parrot singing the national anthem. I wish I was kidding. But there are other puppies that get in on the action, too, throughout the course of the game. Who will get the most tackles? Will anyone get sacked? Who will make a touchdown (yes, they do count those!)? Who will step in the waterbowls the most? Who will capture American's hearts? You'll just have to tune in with me and Best Week Ever's Dan Hopper (separately) on Sunday, as we both think it's better than some stupid football game. I promise to caterwaul about the patriarchy with extra fervor on Monday to make up for it.